In this article I will examine the process of improving your game by evaluating, expanding and simplifying it at the same time. This process is not just a technical one; it is also a process of bettering one’s self, as the important part of this journey is the journey itself and not the destination. Anything that helps your game become more efficient is "useful" in Brazilian Jiu Jitsu. Any technique or strategy that works on experienced/resisting opponents will do. Everybody knows that most techniques look fancy on instructional videos, but in real life an opponent can just posture out and put you in all sorts of bad spots. There are no magic recipes in life and Jiu Jitsu is no different. What works in Brazilian Jiu Jitsu is not always easy to identify. One of Marcelo Garcia's students once asked: "Professor, you keep telling us to go for the underhook, but my opponents will just not let me get it." Marcelo replied, "Sometimes, you just have to fight for the underhook." If that is not the answer of a Zen master I do not know what is. So, even if you have great techniques in your game, you still have to fight to get them to work against a resisting, adopting opponent. You have to keep absorbing and working on what you retain. Then again, in reality, absorbing techniques is a process of learning from others. If you show me a good technique, I will try to incorporate it to my own game. And in our day and age you do not really need to train in person with an instructor to learn from him. There are tons of DVDs, online videos and sometimes just watching another athlete using a technique in a rolling session or in competition will do. Be thankful of other people who are generous enough to share their knowledge and always give credit to the originator of a technique. Personally I prefer using a competitor's name to describe a technique and I always mention the instructor who was kind enough to show it to me. Another great learning tool is the power of observation. It is the world's greatest school, so I watch fights a lot. And I also look for techniques in wrestling or judo competition. The good thing with judo or wrestling techniques is that they are rarely used in BJJ, so even the best competitors will not be expecting them and you may catch better athletes than you by surprise. To come back to Bruce Lee's conceptual framework, what is useful for me does not have to be useful for you. For example, a lot of competitors with knee injuries do not use standing passes. I have strong legs so I prefer them. A great example of this is Jean Jacques Machado. He was born with Amniotic Band Syndrome, which left him without fingers on his left hand. Common grips would not work for him so he had to adopt a wrestling-based grip game, which became highly successful despite this so-called disability. So, it is not just your physical limitations that determine whether a technique works for you or not, your strengths can also play a big role. A competitor with strong hands and grips may specialize in arm-in guillotines, whereas a guy who is not as strong, but has long limbs may decide that D'arce chokes work best for him. Having a great instructor is very important, but knowledge is out there for the restless observer. Anything that helps cover weaknesses in your defense or adds to your strengths will do. So keep an eye open, learn and absorb constantly. As I mentioned before, there are a lot of techniques that look fancy when you apply them in drilling sessions, but will just not work in real fighting. Then again, not all techniques will work in all aspects of Jiu Jitsu. Sport Jiu-Jitsu is different from Jiu Jitsu for MMA or self-defense. Gi and no-gi Jiu Jitsu are also very different. So, you need the right set of tools for the right job. I like to say that I am "old school," but the truth of the matter is that a lot of old style techniques are not as effective in modern sport BJJ. Competitors today have better wrestling or judo, better athleticism and overall fitness, and depending on where they train, they may be able to roll with other great athletes on a daily basis so they have answers for everything. A lot of techniques need to be modified or trained in a different manner to be effective. Others are simply not effective today. And again, what is useful for others may not be useful for you. Discarding what is useless is a matter of available options and rational choices. You cannot train in hundreds of techniques when what you really need is a set of techniques that work in synergy; a small number of moves that complement each other. Besides an overall knowledge of the basics, you should also have 3-4 go-to techniques from every position instead of getting lost in the hundreds of variations available. Discarding what is useless is an essential part of sharpening your game, but don't be too fast in rejecting techniques as useless. With some techniques you need to work on certain attributes in order for them to work. For example, you cannot take a student who has never worked on neck strengthening exercises and bridging drills and teach him bridging reversals. He will just hurt his neck. You also cannot teach someone inverted techniques before he works on inverting. So, after years of training you may discover that techniques you rejected in the past now work for you because you have the right skills to make them work. In order to reach the masses and adjust to the growing number of students, a traditional martial arts system has to establish some sort of pre-conformed set of techniques as standards for the instructors to follow. As a result, all members will be conditioned according to the prescribed system. Many will probably end up as a prisoner of a systematized drill that has its own doctrines and often the doctrine becomes the gospel truth that you cannot change. Brazilian Jiu Jitsu is different. It still is a martial art, but as it is competition-driven it allows for freedom of expression and that is why, as a student of Bruce Lee's concepts, I was attracted to it in the first place. Actually, in my humble opinion, Brazilian Jiu Jitsu is closer to Bruce Lee's concepts that any striking art. Unlike classic martial arts, western wrestling and boxing have been like this from the beginning. You will not see two wrestlers or boxers with the same style. In fighting, sports like boxing, wrestling and now Brazilian Jiu-Jitsu, gifted athletes often create new techniques or modify old ones, and these techniques can change the game considerably. What is the driving force behind people's urge to search and create new techniques? It is a combination of a need for individuality, creativity and effectiveness. 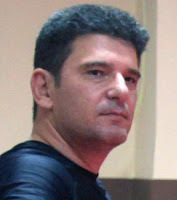 Everybody today knows how Roberto "Gordo" Correa developed the half guard game when he suffered a serious knee injury during his training and was forced to re-evaluate the way he grappled on the mats and started developing a half guard game. During this time, most people saw the half guard as a transitional position used to stall or create space and recover guard. Gordo began using the half guard as an offensive position. What he discovered changed the face of the modern sport of jiu jitsu and now everybody has to work on their half guard game. As far as I am concerned, the greatest innovator in sport BJJ is Marcelo Garcia. He is the one who bridged the gap between no-gi, wrestling and Brazilian Jiu Jitsu. He popularized, created and/or improved a lot of techniques that were not available or popular before his era: X-guard, single leg X-Guard, arm drags, his patented guillotine aka the "marcelotine," etc. Many of today's popular techniques did not exist 15 years ago. So, in BJJ, if you can discover a new technique, you are welcome to do so. And although you may not be able to apply this technique against top competition, your students may be able to do so in the future. It takes time for good techniques to shine as you need to find the correct set-ups and your body also needs some time to start adapting to new techniques. There is no substitute for talent and athleticism in sports. People can reach the same destination from different paths, so keep in mind that as you are feeling proud of yourself for discovering a new footlock, you may soon find out that somebody else discovered it first. In the end, there are all sorts of things you can discover on your own, not just submissions or sweeps. Concepts, set-ups, drills, grips and training routines are only some of the areas you can use your creativity on. There are lots of ways to get new ideas. For example, I study a lot of competition footage. Some times things happen in scrambles, which can be used as inspiration for new techniques. You can also discover new techniques or set-ups during your rolling sessions. While you are going for a kimura, and your opponent's arms are too long for you to grab your own wrist, you may find another way to get it, or a way out to another technique. New techniques can derive from all sorts of different sources. No matter the source though, as you learn and drill these techniques, there is a certain process for using these techniques in order to evolve your BJJ to the next level. I call this process the "melting pot." 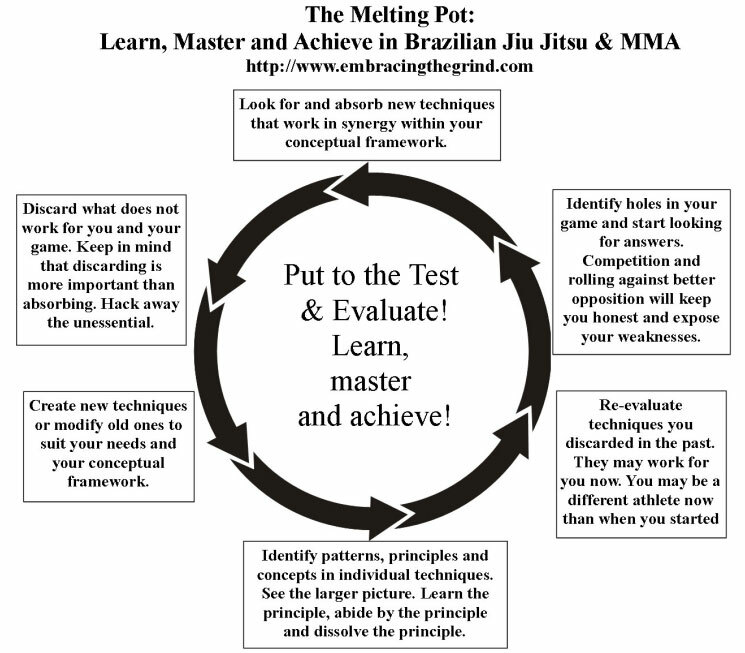 The “melting pot” is a learning process. This process combines a constantly changing curriculum of techniques within a concept-driven game. 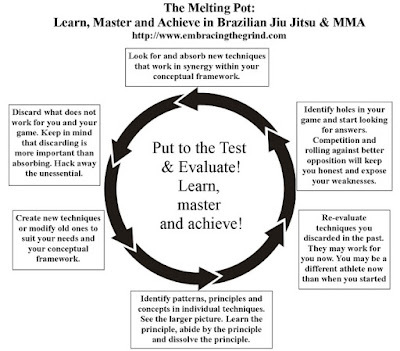 This works for all combat sports, not just Brazilian Jiu Jitsu. The melting pot has 6 different stages, but these stages often interconnect or blend with each other because the human learning process is a very complex one. A lot of people use this process out of pure talent or just by having a restless mind, without ever realizing it. You can see a graph of this process in the following image as a set of 6 arrows following a never-ending circular motion. 1. Look for and absorb new techniques that work in synergy within your conceptual framework. 2. Discard what does not work for you and your game. Keep in mind that discarding is more important than absorbing. Hack away the unessential. 3. Create new techniques or modify old ones to suit your needs and your conceptual framework. 4. Identify patterns, principles and concepts in individual techniques. See the larger picture. Learn the principle, abide by the principle and dissolve the principle. 5. Re-evaluate techniques you discarded in the past. They may work for you now. You may be a different athlete now than when you started years ago. 6. Identify holes in your game and start looking for answers. Competition and rolling against better opposition will keep you honest and expose your weaknesses. Finally, you will notice in the centre of the graph, the most important aspect that will make all these steps work: Put everything to the test and then evaluate it. As you start embracing the daily grind of training, your technical “toolbox” will get tested in this melting pot of blood, sweat and tears, disappointments and frustration; it will change and you will change with it, as you evolve your game from techniques to concepts, from correct form to formless form, from knowledge to awareness. So, put it to the test and then evaluate it. Learn, master and achieve!